This div will hide after above count down expired! The other important concept is to hide the particular div when the count down ends. This is very useful some places in website, for example if you set the registration last date countdown. After countdown expired the particular registration form should hide, so that types of situation you can use this concept. 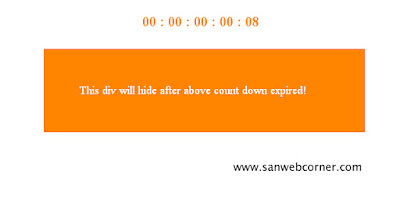 This div will hide after above count down expired!